A Maryville man is suing the Aluminum Company of America , Alcoa, because he says the company caused his 25-year-old daughter's death. Amanda Satterfield died of cancer one year ago. Her father, Douglas Satterfield, has worked at Alcoa for 32 years, where he was exposed to asbestos. The lawsuit claims Amanda was also exposed because her father inadvertently brought the carcinogen home on his work clothes. "You can't imagine what it is to lose a sister," says Amelia Satterfield. The teenager remembers her big sister, Amanda Satterfield, who in 2001 was diagnosed with mesothelioma, a deadly form of cancer often associated with asbestos exposure. Her family says the only exposure she had was from her father's workplace. "Couldn't believe it, couldn't believe it, we had no idea how she could have got asbestos exposure until we did some research and found out how she could have got it. There's no other way she could have got it," says Douglas Satterfield. "Household members can sustain cancer or can contract cancer from asbestos fibers that are brought home from work," says Satterfield's attorney, Greg Coleman. Amanda filed the lawsuit in 2003. Her father has taken it over since her death. "It could be avoided, it could be avoided, and they choose not to avoid it. They choose to spend their money on litigation instead of making our plant safer," says Douglas Satterfield of Alcoa, Inc.
At a hearing Monday in Blount County Circuit Court, Alcoa's attorneys sought to have thecase thrown out. They argued the company was not responsible for Amanda because she was not their employee. Satterfield says they should have at least told the workers about the danger so they could take precautions. "It's not fair for us, and I know life's not fair, but she was my only sister and I miss her a lot. I miss her everyday," says Amelia Satterfield. "She smiled constantly, even when she was in pain, going through chemo, she was a fighter. She's always been a fighter." And now her family vows to continue her fight. "My hope is justice," says Douglas Satterfield. Alcoa's attorneys declined to comment on the case. The judge did not decide immediately whether the case will continue. Both sides have said they expect to appeal his decision. If you would like to talk with an experienced Mesothelioma lawyer to understand and protect your legal rights, please tell us about your Mesothelioma Case. 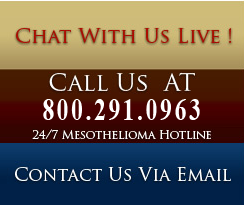 Our Mesothelioma lawyers have an extensive record in Mesothelioma cases and will help you evaluate your case.